Thought I would take the time this morning to explain some very important and often over looked notes on the ever increasing number of RNAV STARS. Many people who fly on VATSIM take these procedures for granted falsely believing their FMC will save them from any errors, this is not the case at all. Remember its your responsibility as the pilot to comply with all notes, restrictions, etc...on a published STAR. If we take a look at this note this is extremely important for the pilot to follow. What does this mean? This means even if you have not recieved a "descend via" or "cross XXXXX at 10,000" you still MUST follow publish speeds on the STAR. 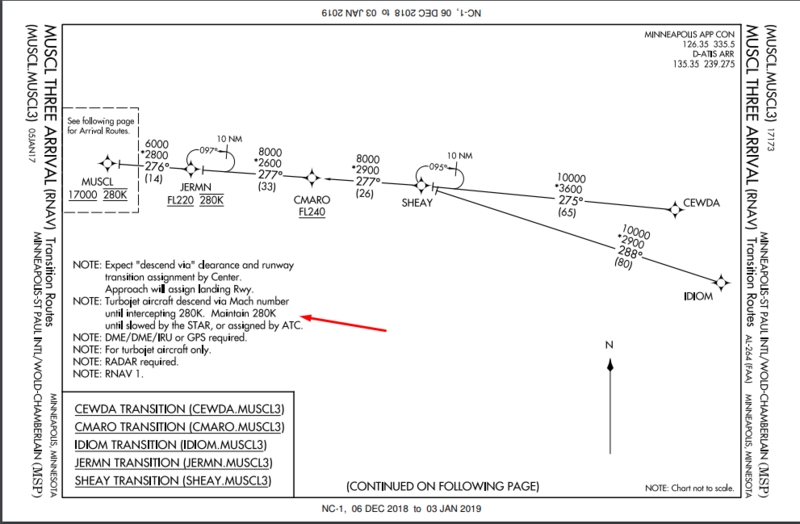 By taking a look at this RNAV STAR into KMSP you can see the note pointed out there. This means if ATC gives you a descend via and your FMC has started you down over CMARO lets say at FL270 you are required to be at 280kts. The FMC will NOT have the 280kt restriction over CMARO as it is not published, it will be descending at a speed relative to what your cost index is set to. So you as the pilot MUST override the speed manually OR change the descent speed in the descent profile of your FMC. This is extremely important to do as ATC expects you to! ATC can change your speed as necessary for traffic requirements this would sound like "DAL123, descend via MUSCL3 arrival RWY 12L transition, except maintain 310kts until advised". Whats that 12L transition in there?? Lets start our next topic of discussion. This is another area where it gets a lot of VATSIM pilots on not fully understanding the arrival procedure or how to program the FMC correctly. Every airport in the US that has runway dependent STARS can be confusing, as they have their own little twist in the way its published, cleared, and flown. NOTE: Expect "descend via" clearance and runway transition assignment by Center. Approach will assign landing Rwy. MSP is a great example of being a little different as many RNAV STARS you do not get a runway transition from center. The ZMP controllers can provide insight on this in more detail, but this was developed this way because it works for ZMP. Important thing as a pilot you have verify your FMC is programmed correctly for the clearance received. Planning ahead can save you lots of headaches during crunch time when you actually start your descent. Check that ATIS as soon as your in-range as it will give you runways in use, do what we do in the RW take a educated guess to what you will get in your clearance. This example into KATL the NOTES section tells you what runway you NEED to have programmed. If flying the GLAVN1 arrival you MUST have it programmed correctly as this STAR is runway dependent. When KATL is landing to the WEST (you know this by checking the ATIS) you must select runway 26R, if landing to the EAST you MUST select runway 09R. Keep in mind Approach can and may change your runway assignment that is different but ATC is EXPECTING you to have the right runway programmed in from the start. Unlike the MSP example Atlanta Center WILL NOT tell you which direction the airport is landing or what runway to expect. You as the pilot are expected to check the ATIS before starting descent and program your FMC correctly. Want a tip for checking the ATIS quickly and efficiently on VATSIM?? If using V-Pilot right click on the ATIS in the controller list, click on "get controller info" this will display the D-ATIS format so you don't have to actually listen to the ATIS. This only works where controllers are using VATIS to simulate putting out a digital version of it, if you don't receive the information digitally, then of course listen to the ATIS. That is all for today! This might seem like a LOT of information, well thats because it is! If anyone has any questions please ask away! If you like this kinda of information I would be more then happy to sit down with some of you and go over this in more detail. Perhaps maybe I can turn this into a monthly class of some sorts?? Awesome write up. Very important indeed. If we can’t have mandatory pilot training, the least we can do is give the opportunity for accidental learning! This is a fantastic post. Thanks as always, Matt.